Like minecraft seed list they have, what you can find and everything, so we should have ours own on here. Heres a seed I just started. Will be edit if found anything or, add more seeds. how the heck can i enter this seed when i create a world!? Open the game, create a new world, then close the game. Open that world's map_meta.txt file in your favorite editor. Find and change the "seed" value near the bottom of the file. Start the game and go into the world you just created, and it will be re-generated with the new seed. VanessaE wrote: Open the game, create a new world, then close the game. Likwid H-Craft wrote: Like minecraft seed list they have, what you can find and everything, so we should have ours own on here. Only 1 seed? you said a list of seeds! How the snap do I find the seed value!!?? Press F5 in the game and it will be among the info at the top left of your screen. Or you could find it in your worlds file, one of them at least. The Seed "Minetest" generates a bunch of cool lava pools not far underground. I am making a Big Document going have loads of Seeds. And it will have Images. But I am going test this as my seed: ForTheLastMeseOre. I'm a Transgender no shame about it. I prefer to be considered as a "Girl/Lady/Miss/Madam/Female" for now on. a nice start might be a list of the seeds used by the public servers. Why are seeds soooo interesting? One number higher and it generates a diffrent map. But there maybe over +100,999,999,999,8264,764,274,916,175,826,817,096,765,125 Seed Combine in Minetest. Alt. Tester wrote: Yeah true dat Krock. sfan5 wrote: Nope, seeds are uint64_t. Hmm okay. 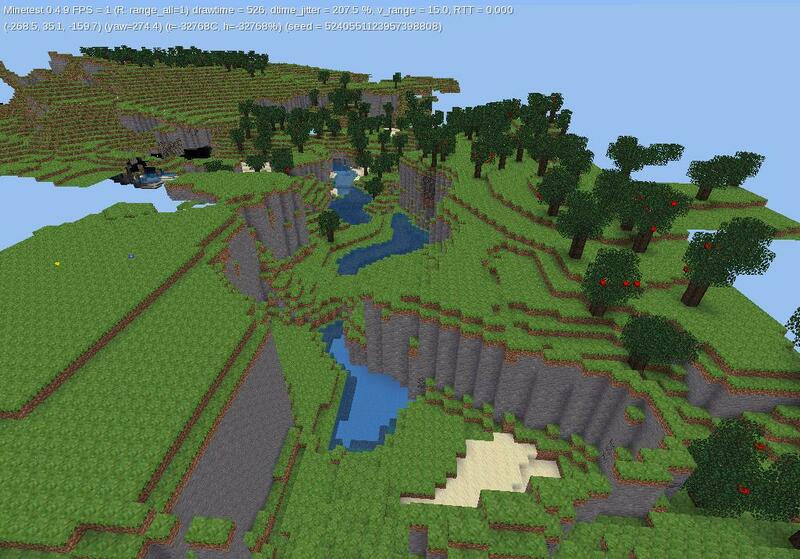 I thought someone said, it only uses 32bits..
Near spawn are very very very many cliffs and other cool things. That is my best seed I have ever found. Do not call me -minetest. Call me DS or DS-minetest. Are you a minecraft noob ? The seed NO MORE WOOD PLEASE and using "flat" world generator spawns you in a desert not too far away from some green land. Quick tip for people having this problem, just like I did. You don't have to enter big long seed numbers, try starting with seed number 1 and go through them incrementally. You should be able to very quickly find a few that you like with very easy to remember seed numbers. In the Flatmap mapgen I like seed numbers 20 and 85.